Comments and resources from the Our Histories Revealed exhibitions held in Goole (Feb - Apr 2019); Beverley (May - June 2018) and Hull (Sept - Oct 2017). Find comments from visitors to our Goole Museum exhibition below. If you haven't visited yet, it's open until Saturday 6 April so you still have time! "I wonder why there isn’t more in the library to tempt people to the fantastic exhibition currently on show in the museum African Stories in Hull and East Yorkshire – Our Histories Revealed and a fantastic opportunity to display books on black British history not taken advantage of!​​"
"I enjoyed the exhibition currently on show and hope that the Goole community find it interesting as it reflects the importance of understanding our past and how this may impact on our future. 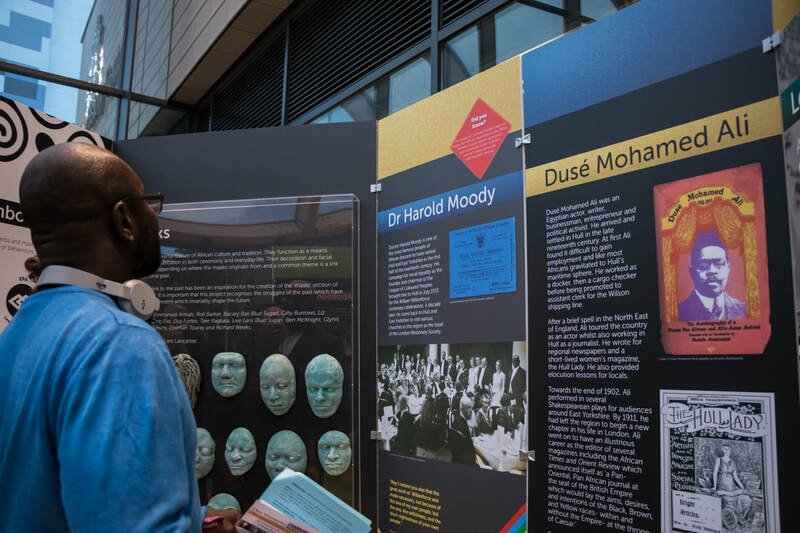 Be great if books and other materials related to the exhibition were on show in the main library.​"
"Fascinating exhibition well researched and presented. It needs to be promoted to schools and other educational organisations. I really enjoyed the historical linked to the contemporary. Please could you advertise the exhibition to the wider community. Be great if there was a bigger/more obvious presence in the library. Thank you​." "Excellent exhibition, well presented and offering so much valuable history which, for the most part, I did not know of before. The masks are stunning and a brilliant addition to the exhibition." “A lovely and warm exhibition with awesome care and research. Well done Gifty, Audrey and team. Needs to be more widely publicised as the info is so rare." “Wonderful exhibition – very well displayed. Pity it is so little advertised as it deserves a bigger audience. Congratulations to the team at African Stories in Hull and East Yorkshire project for rescuing these stories from obscurity." Find everything that you need to know about our Beverley exhibition below. ​Find out more about the exhibition on our Events page. Head to our picture gallery for images from the exhibition. "Just brilliant! Every panel full of interest and surprise"
"Incredibly well researched. 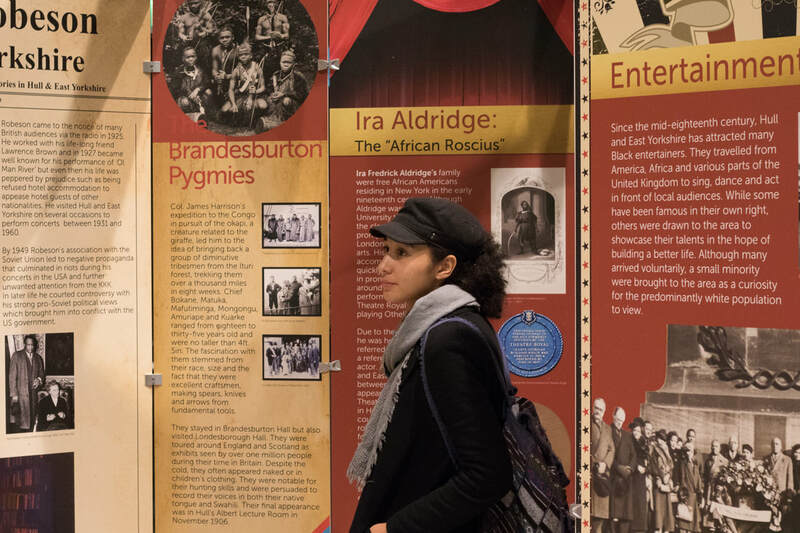 Fascinating insight and important stories that are very rarely told in this area"
"Congratulations on an extremely valuable and socially important exhibit. More of this please!​"
"Most enlightening. Interested to find out the origins of the Beatles' song"
"I like the idea of making an exhibition about this and I also really like the layout of the posters - especially the fabrics on the edges of them"
"Well done. Very informative. Impressive archive job ... really enjoyed it"
"Very pleased to see a comment of mine included - What a surprise!​"
"Congratulations on a fantastic exhibition. Well done to all involved. Just been reading all on the train. Loved it"
"Fascinating research revealing the rich history of our region. Excellent!" "This at Treasure House is great!" "Brilliant. Lived around here all my life and never knew about any of this in the corridor except of course [Clive] Sullivan"
"Wonderful to read and acknowledge this bit of history. Great exhibit. Thank you"
"Such important work. Thank you​"
"I found this exhibition very informative on a relative unknown element of Yorkshire society and culture"
"Wonderful exhibition so very informative"
"An excellent and informative exhibition! Very professionally displayed and attended by friendly, helpful and welcoming staff. Well done to all involved and thank you"
"Really interesting stuff - love all the links to American history in particular"
"A very interesting exhibition full of information and well compiled"
"A fascinating story so well presented"
"What a delighful exhibition - lovely to read social history and to recognise the rich heritage a city like Hull has"
"Very interesting - with so many life stories"
Here are a selection of comments left by visitors to our exhibition, 'Our Histories Revealed', at Hull History Centre during Sept/Oct 2017. To see more images of the exhibition and associated events go to our Picture Gallery. A brilliant exhibition. Another proud history of Hull people that's little known. How wonderful. A true story of this beautiful race. about without all this research. Amazing representation of the black heritage. So proud and privileged to share. Well done Gifty & Lauren. So engaging and fascinating. A massive work of art to have documented personal histories to create a social story of Hull. Wonderful stories about a much neglected part of British history. What a wonderful exhibition. I have spent a lovely morning reading & learning about this beautiful part of Hull’s history, I was totally unaware of. Extra special day with the visit from the High Commissioner of Ghana. Will certainly spread the word. Our Histories Revealed offers a perspective on Hull that I barely knew existed! The exhibition intriguingly follows notable figures as well as lesser heard stories of humanity on a smaller scale. Both are touching stories of Hull’s surprisingly diverse past – can’t wait to delve deeper online! Came back to finish the exhibition as was so impressed with the first half. I am ashamed today I knew very little about wartime service of Black officers & men & women. It is airbrushed out of history/films. Well done to all involved – brilliant. I really enjoyed this wonderful exhibition! Very incredible explaining and amazing presentation. It was so full of amazing people; it was so well written and very interesting. Thanks so much! An excellent day of talks and visit to the exhibition. Travelled from Ipswich to see my family (Bowers) display. So nice to have my family’s history on display and for people to have an insight of the journey and the mixed heritage that I derived from. An excellent exhibition. It shows just how far we have progressed regarding racism since the 18-19th centuries. Fascinating insight into other’s lives. Very moving and life affirming. Surprised to see so much information ie racial – it was so interesting – so much to see in the one place. Pity we didn’t have more time but we will be back to delve in the family history dept. Our ESOL students really enjoyed the exhibition – brilliant visuals and very interesting to see the stories. LOVED the masks!! It was very good and inspirational and there is lots of amazing, interesting facts. A truly inspired cultural exhibition. Well done! Very concise and wide-ranging and interesting to learn of Hull’s history. I love the timelines helps to put the information in context. Feel more educated on black history wooo! It was very good and Inspirational an there is lots of amazing, interesting facts. Really educational. Brilliantly curated. It is so interesting to learn about the local people and the Black history of Hull. The story needs to be told. Outstanding exhibition, loved all of it. Well thought out well done to everyone involved. Proud to be part of Hull’s heritage. Fascinating exhibition. Arresting in information & the virtual display. Valuable research to get us all asking questions. Amazing exhibition, so informative and extremely interesting. It is fascinating to know that so many Black and mixed race people chose to visit Hull and area. Hull and Liverpool so much in common. Racist behaviour among the Anfield faithful stopped with the arrival of that most elegant skilful player, John Barnes. A truly extraordinary exhibition. Thought provoking and inspiring in equal measure. How instructive to show such a different element of Hull and region’s history. Diversity always enriches, if only this could be widely recognised. Real thanks for such a great exhibition. An informative and inspiring exhibition. Thanks for all your hard work in telling the stories of Africans who lived and work in Hull and its surrounds. Absolutely fantastic exhibition showing the long and brilliant contribution black people have made to this city . Very pleased to see Christopher Alder prominently mentioned especially as those in authority want people to forget his story altogether. Well done on a brilliant exhibition. An interesting afternoon volunteering here. Thank you to Gifty for our mini ‘masterclass’ before the shift. A fascinating insight into the rich tapestry of Hull and East Riding culture and Black history. Excellent. Wow! Loved the exhibition. I hope it continues and gets to, and inspires a wider audience. Very interesting and enlightening exhibition, nice balance of content. Maybe next time a little larger and run for a longer period. Very interesting, it has given me a bigger understanding of Hull’s Black heritage. Very good and informative exhibition. Wonderful exhibition, I learnt so much from it. Thank you. Amazing exhibition. Thanks so much for telling these stories! Work wise this is much needed and I’m so glad it’s finally here – well done and congratulations to all involved! Fascinating and moving exhibition – clearly and logically displayed so you are led round to the next interesting part. Excellent. Very well organised, excellent – pity the plants are not as well looked after! A fascinating insight. The more you look the more there is to see! What a wonderful display well done! I have been a volunteer today thoroughly enjoyed my shift. Hope to be back. Such an interesting exhibition. Loved the stories of individuals & families. Some very brave people who suffered terrible hardship & ignorance of others. Excellent exhibition. A story that needs to be told. Thank you. A truly brilliant exhibition, very thought-provoking. It made me completely rethink parts of our history. The exhibition has done a fabulous job of writing these fascinating stories into the fabric of Hull & East Yorkshire (& British) history! Dr Lauren Darwin was very knowledgeable and has clearly worked very hard to bring these stories to life. A big well done & congratulations to everyone involved! Great shift today excellent exhibition. Lauren was so knowledgeable. Most interesting and worthwhile. Please keep expanding the archive, and try to find a permanent site to exhibit it. Very interesting exhibition. Really enjoyed it. I loved looking at the masks. I was excited to see everything. A very though provoking exhibition. Thankyou. Helen S.